Namely, in the last two decades, large animal models – small ruminants (sheep and goats), pigs, dogs and horses – have been used to study the physiopathology and to develop new therapeutic procedures to treat human clinical osteoarthritis. For that purpose, cartilage and/or osteochondral defects are generally performed in the stifle joint of selected large animal models at the condylar and trochlear femoral areas where spontaneous regeneration should be excluded. Experimental animal care and protection legislation and guideline documents of the US Food and Drug Administration, the American Society for Testing and Materials and the International Cartilage Repair Society should be followed, and also the specificities of the animal species used for these studies must be taken into account, such as the cartilage thickness of the selected defect localization, the defined cartilage critical size defect and the joint anatomy in view of the post-operative techniques to be performed to evaluate the chondral/osteochondral repair. In particular, in the articular cartilage regeneration and repair studies with animal models, the subchondral bone plate should always be taken into consideration. 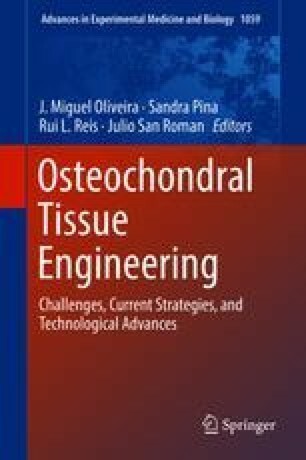 Pilot studies for chondral and osteochondral bone tissue engineering could apply short observational periods for evaluation of the cartilage regeneration up to 12 weeks post-operatively, but generally a 6- to 12-month follow-up period is used for these types of studies.